This is actually the English translated edition of the Japanese art book 艶浪「無限の住人」画集 (ISBN 4063647234) published back in 2008. This hardcover edition published by Dark Horse features an additional 32 pages of artwork. That's over 150 pieces of samurai art. If you like the pencil and ink covers by Hiroaki Samura, then this book is for you. It contains primarily the covers (up to manga volume 17), other coloured illustrations, the chapter break splash pages and some inked panels. Everything's about twice the size of the manga illustrations. This is a pretty big book. The reproduction is pretty good, especially for colour illustrations where you can see the texture of the canvas showing beneath the paint. About half the book is in pencils. Unfortunately, there aren't any rough sketches or comic layouts. 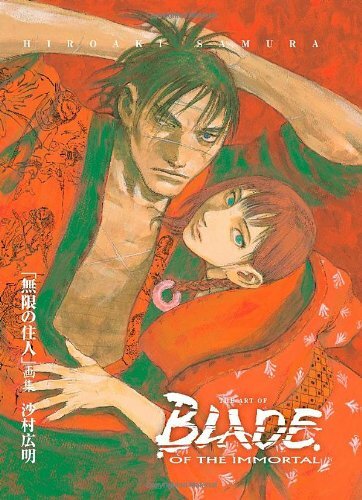 If you're a reader or collector of Blade of the Immortal comics, then you already know what to expect. Oh, this book is also much cheaper than the Japanese edition.